Afrivista Tours Stellenbosch South Africa .Wine Tours is our speciality! / General Tour Photo Gallery / Tour Action Photo's / In the garden at Rustenberg. In the garden at Rustenberg. I was going through our photos and remembering the great fun we had during our trip in August. The memories are still fresh in our minds and thanks to you I now have a whole different view about wines. 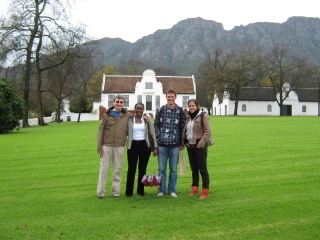 We are looking forward to returning to SA and another wine tour will surely be on our itinerary. We loved your the laid back nature and how you adjusted the tour to suit our interests. Keep up the great work. As far as where to live, downtown is expensive and mostly hipster. You will not find anything having a large backyard and garden there. Mission Valley has the trolley system that takes you right downtown and North County has the Coaster commuter rail system that does the same.